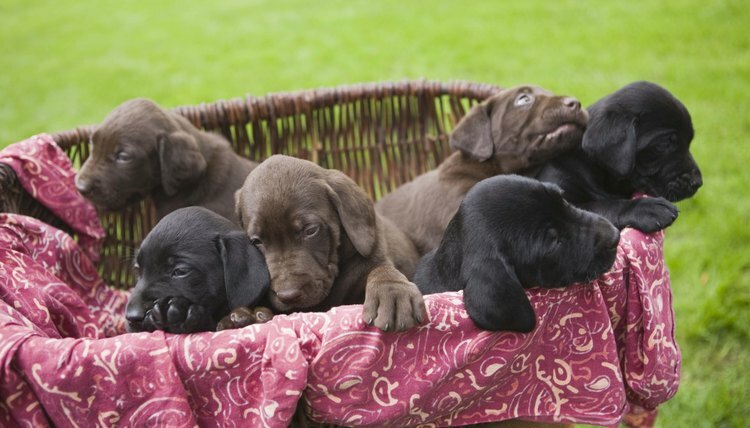 Most of your work in helping your dog to whelp her puppies comes in advance of delivery. You must provide her with prenatal care and a safe, comfortable location to give birth. Ideally, the mother dog should be allowed to raise her puppies indoors. If the dog must have her puppies outside, you should provide an adequate whelping box. Put an outdoor whelping box in an area protected from the elements, predators, pets and children. Assemble the box for your outdoor dog two weeks before your dog’s due date. Find a location, preferably a shed, garage, doghouse or other enclosed building, that is out of the elements. If nothing else is available, stretch a tarp over and around the sides of the area where you will install the whelping box. The tarp has to protect the mother and babies from rain, snow, sun and wind from all sides. Place a box in the location. The box, which should be made of heavy-duty lumber, should have four sides, and the sides should be high enough to keep drafts out and prevent puppies from climbing out for at least their first three weeks. However, the sides need to be low enough that the mother dog can easily get in and out. The box should be large enough to allow the mother dog to stretch out completely. Attach a rail, made of either pipe or wood, about 5 inches from the bottom of the box and around all four edges. Attach the rail using screws and a small drill. This rail is a guard to keep the mother dog from smothering or crushing a puppy by trapping it between the sides of the box and her body. Cover the inside of the box with contact paper. Use wood glue to secure the edges of the contact paper to the wood. This makes cleaning the inside of the whelping box easier. Install heat lamps or fans, depending upon current weather conditions near the whelping box to keep the puppies’ environment as close to ideal temperatures as possible. Line the box with layers of newspapers. Place an old blanket in one corner of the box. In addition to having the whelping box ready for your dog, keep your veterinarian’s telephone number handy and an emergency number for a veterinarian outside of normal office hours. Have gas in your car and a friend on standby to help, if you have to drive your laboring dog to a veterinarian or emergency animal clinic. Assemble a set of tools that you might need to assist the mother dog in delivery a couple weeks before her expected due date. Include newspapers, rags, paper towels, heating pads, scissors, hemostat, unwaxed dental floss, surgical gloves and petroleum jelly. Once your puppies are weaned, consider having the mother dog spayed. There are thousands of dogs, including purebreds, killed in animal shelters across the country each year because there aren’t enough homes for all of them.